Greetings! Nightsong here, I’m going to be doing a few guests posts here, and some of you may know me from my short fiction story on here, “What goes Bump in the Night.” I’m an artist, writer, and animator, with a variety of interests including, reading, art, animal care and conservation, and too many fictional characters and universes to name. I look forward to providing fun and informative content for you guys! We all deal with negative, overwhelming and worrisome thoughts, feelings and emotions. Lately I’ve found a method of self-expression that has done wonders for my anxiety and depression! It’s called vent journaling, and I wanted to share it with you guys as a coping skill to add to your collection. 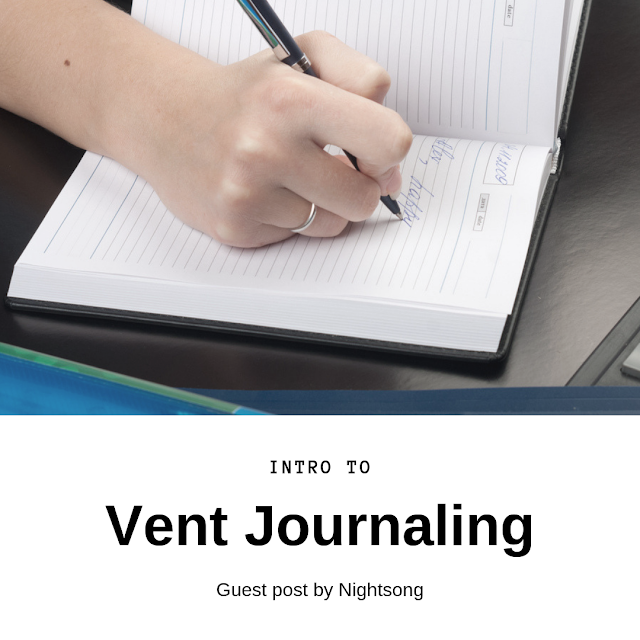 So, What is Vent Journaling? 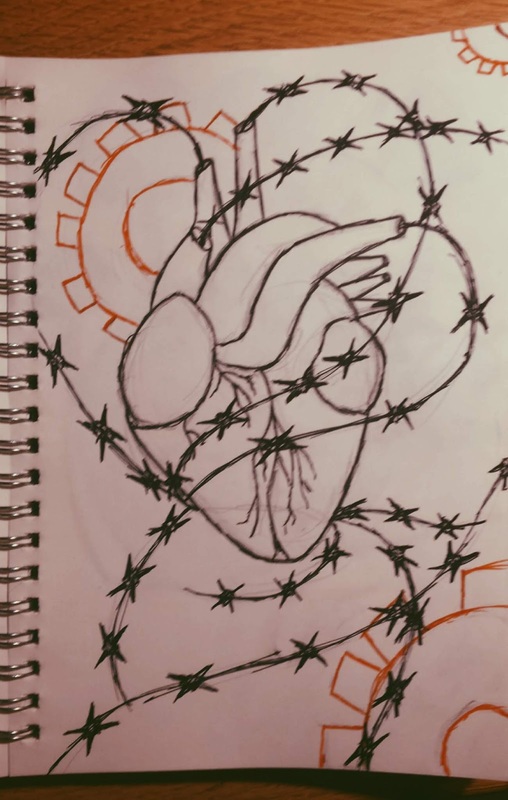 Vent journaling is a specific type of journaling that can be used to express negative or overwhelming thoughts and emotions. It can be done through written words, drawing, painting, collage, or any artistic medium. Today I hope to give you an introduction as to what vent journaling is, and how you too can do it to provide an outlet for negative thoughts and emotions, dealing with anxiety and depression, and any troubling events, situations, or ideas. 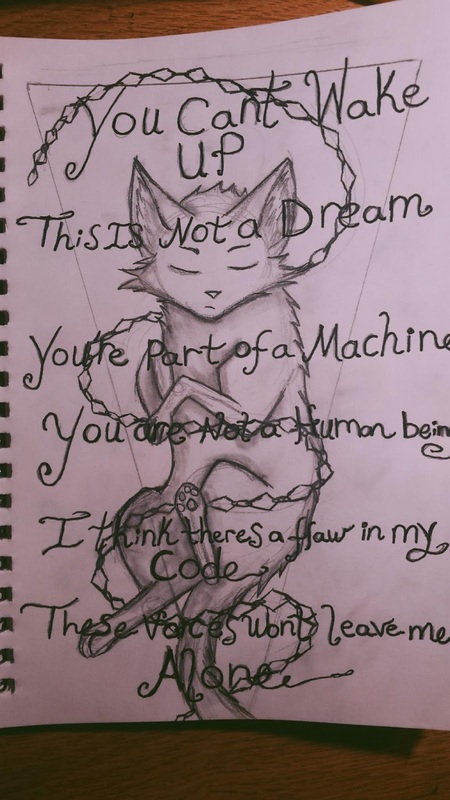 For this post I will be using my own vent journal as an example, so note that yours does not have to look exactly like mine, use your creative freedom. 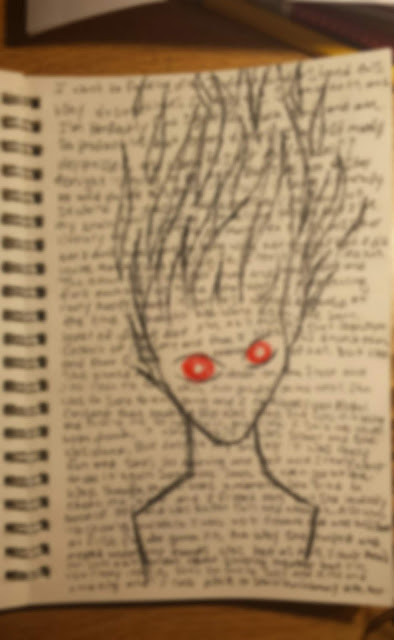 The first thing of course is to find a notebook or sketchbook to be your vent journal. Depending on the style of vent journaling you want to use may dictate the kind of journal you need, so if you are going to have a more writing heavy journal you may want a spiral bound lined notebook or composition book, however if you’re going to do more art in yours you may want a sketchbook instead. Note: When choosing a sketchbook it's important to keep in mind the type of paper it contains, if you’re going to be doing more work with painting and markers you might want to choose thicker paper that won’t bleed onto the other pages. Personally, I use a 13X19 Centimeter spiral bound sketchbook. You should of course choose a size that will best work for your needs and personal preference. Step One - Decorate it! Use collage, painting, drawing, or any combination to decorate the cover of your vent journal. Make it yours, make it visually appealing to you, it doesn't have to look traditionally “good” as long as you are happy with it. 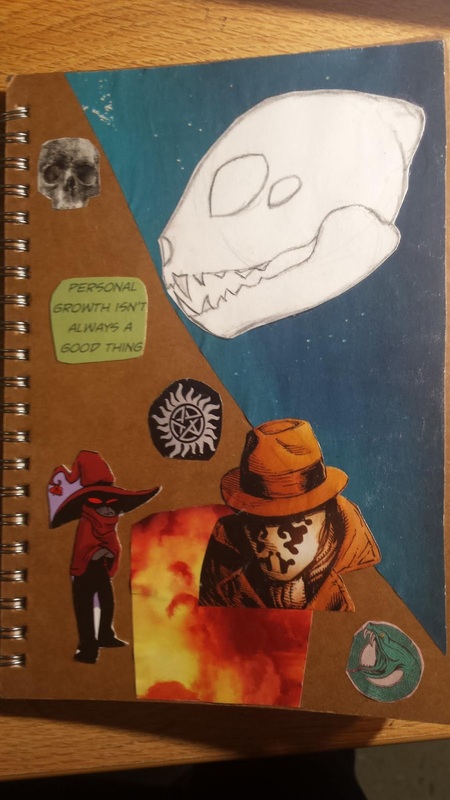 For mine I did a collage of cut out images and colors, and a small drawing of a skull I did myself. I used rubber cement to glue down the pieces as smoothly as possible and then covered them with a coat of Mod Podge to seal and protect it from tearing. After your list of guidelines, include a section with self-care after use tips and advice to follow once you’re done working in the journal. For example, ask yourself why you are feeling that way, what could be causing it, and is there any action you can take to help it? Remind yourself to take a step back and breath, go on a walk, take a bath, nap, something to get away from the negative thoughts for a bit. Step Three - Start Journaling! 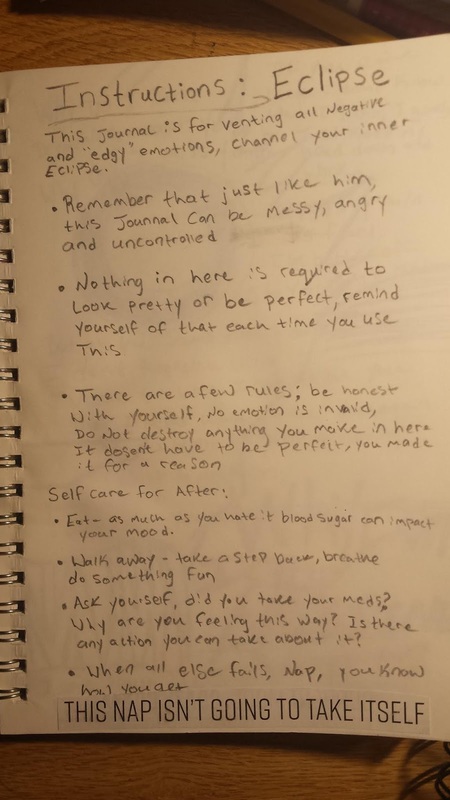 You don’t necessarily have to be struggling to use this journal, though that is definitely when you should use it most as a coping skill and outlet, but you can also use it to help you relax, get thoughts out, or experiment artistically. You can use any materials, pencils, pens, colored markers, water color paint, collage, or brush pens. Also, you don’t have to use the same materials or same style throughout the whole thing, you can change it from page to page depending on your needs. My journal is primarily art pieces, but I also sometimes like to switch it up and use just written word, or a combination of words and drawing. You can work off prompts or present ideas but I find it best to just let it flow naturally based on how your feeling at the time. This is up to you, how you express yourself, what methods of journaling you prefer, and what emotions you struggle with, but I can give you some advice and examples. - Collage : this is also a way to express yourself without being super direct, you can cut out images and words from magazines or catalogues that appeal to you and the emotions your feeling. - Writing and Art : I find drawing something then writing over top of it is a great way to express your thoughts and feelings but writing it over a drawn image obscures the words and I find that really nice to make it kind of abstract and about just getting your emotions out and not focusing on legibility or ability to read it later. In Conclusion - To wrap things up, when working in your vent journal remind yourself that you and your emotions are valid, everything you make in your journal is valid, it doesn’t have to be perfect or pretty or make sense, just like your thoughts and feelings. Be honest with yourself, and be kind to yourself above all. 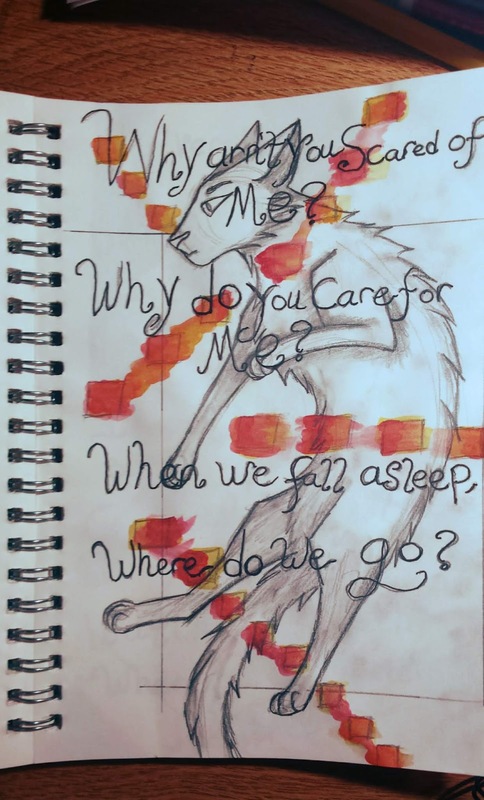 That's all I have today, feel free to include your thoughts, experiences and pictures of vent journaling in the comments below! Stay tuned for more posts like this in the future! Stay Awesome!